John F. Lambert, 88, of Johnston, IA, passed away in the company of his family on Tuesday, January 22, 2019 at Mercy Hospice of Johnston. John was born December 6th, 1930 in Keokuk, Iowa. He graduated from St. Peters High School where he excelled on the men’s basketball team. 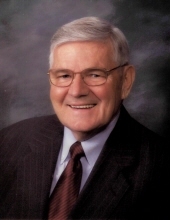 John had an accomplished 60 year career in the meat packing industry including serving as Executive Vice President for the Rath Packing Company in Waterloo, Iowa, and President of Peer Foods, Chicago, IL. John’s entrepreneurial spirit led him to found Perishable Distributors of Iowa where he served as the company’s first president. Not one to idly retire, he continued consulting for many large companies into his early 80’s. John married Mary Jane (Hechler) on April 17th, 1956 and raised three children in the Cedar Falls, Iowa community. He enjoyed golfing and fishing but his greatest joy and happiness was the time shared with his family, particularly those memories made on summer vacations in Galena, Illinois. John was preceded in death by his parents, two sisters and a brother. He is survived by his wife, Mary Jane, sons Bruce Lambert of Des Moines, Iowa and David (Julie) Lambert of Geneva, Illinois as well as a daughter, Linda (Kurt) LaCoste of Fort Worth, Texas; his cherished grandchildren, Samantha, Jackson, Tanner, William and Addison; his sister, Norma (Lambert) Murphy and numerous nieces and nephews who loved him dearly. A memorial service will be held on April 5th at St. Mary of Nazareth in Johnston, Iowa at 11:00 AM with a visitation two hours prior to the service. A second service will be held on April 6th at All Saints Church in Keokuk, Iowa at 1:00 PM with a visitation two hours prior to the service. In lieu of flowers, memorial contributions can be made to Mercy Hospice-Johnston at https://foundation.mercydesmoines.org/donate/. To send flowers or a remembrance gift to the family of John Lambert, please visit our Tribute Store. "Email Address" would like to share the life celebration of John Lambert. Click on the "link" to go to share a favorite memory or leave a condolence message for the family.